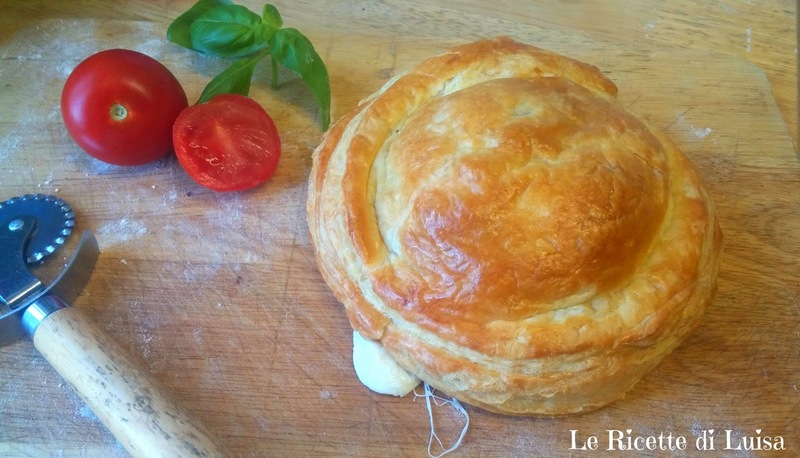 LaBelleMadeleine: Rustico ~ a delicious recipe from my town. Rustico ~ a delicious recipe from my town. Prepare the bechamelle sauce:melt the butter in a small pan on medium heat. When melted add the flour. Mix well, always stirring. Add the milk very slowly, always stirring, until it becomes a cream. Add salt and pepper. Every rustico is formed by 2 discs of puff-pastry (diameter of 5-6 inches), you can also make it square... any shape you like. Put a dollop of bechamelle in the center of the first disc, add 3 chunks of mozzarella and one or two well squeezed can tomatoes. Add a pinch of salt. Beat the egg to use it as a "glue" to attach the two puff-pastry discs together. Brush the edges of the first disc and close the rustico covering the filling with the second disc, pressing well the edges to form kind of a dome on top. Brush the whole surface with the rest of the egg-wash.
Use the rest of the puff-pastry and ingredients to make 2 or 3 more rusticos. Bake in pre-heated oven at 400 degrees for 30 minutes.